The 2017 Honda CR-V and Toyota's RAV4 are both excellent options in the world of SUVs. They're both fuel-efficient and stylish with all the safety features you're looking for to keep your family and loved ones safe. You may be asking, though, what sets these two vehicles apart from each other? Both of these vehicles are spacious on the inside and comfortably seat 5 passengers, but we found that the CR-V offers a little more in the interior department. Some CR-V packages include elegant leather seating. The center console provides ample room for accessories and also outlets for your electronics. The back cargo area can expand to a whopping 70.9 cubic feet. The RAV4 doesn't lack too much in interior comfort, though, with beautiful, uniquely colored seats that contour to fit your body. Featuring a classic power moonroof and additions like push-button start to make your drive more convenient, you'll find enough satisfying comfort in this vehicle too. The RAV4 takes the cake when it comes to tech features. Options for this vehicle include bird's eye camera view, integrated back-up camera and navigation, and Siri Eyes-Free software. A cargo-net hammock in the back will keep your gear from sliding around during driving and can fit quite a bit of items. This, along with the already-large cargo space means you likely won't be running out of room anytime soon. HondaLink is the CR-V's special system set up to give you your music, books, podcasts, news, weather forecasts and more, all at the touch of a crisp 7-inch display. Available also is the smart-key feature which allows you to open your vehicle with the push of a button as long as your key fob is close by. The CR-V comes out on top when it comes to fuel economy. This vehicle sports *26 city/32 highway mpg rating. Your individual mpg will vary depending on your driving habits, but this is outstanding efficiency for a vehicle with this much power. 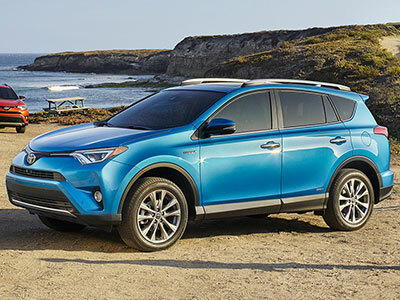 The RAV4 offers *23 city/29 highway mpg. Also a great option for fuel-economy, you can drive more soundly knowing that your vehicle isn't guzzling precious fuel. 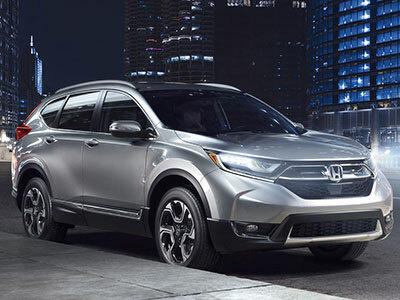 Last but not least, safety is always big for SUV drivers and Honda proves to know what they're doing. With features like lane keeping assist and responsive cruise control, your vehicle will assess how close you are to veering from your lane or into a car in front of you and make the necessary changes. The 2017 Honda CR-V has not yet been rated, but the 2016 CR-V sported a **5-star safety rating from the National Traffic Highway Safety Administration (). The RAV4 also keeps with high safety ratings and features. Some of the same features are available such as lane-keeping assist and other sensors designed to alert the driver to possible collisions. Another safe option for the family vehicle. The 2017 Honda CR-V and its competitor the Toyota RAV4 are both great options for a safe, affordable SUV. However, we feel that the CR-V has a little more to offer when it comes to interior features and overall safety. The fuel-efficiency, ample interior space, and great design make this SUV a contender for youth and the family alike.